50 years ago, the first Rotaract club was formed to give young adults a place to connect and take action for good. Rotaract members from each decade share what the program was like and how it shaped their lives. A wall divides East and West Berlin, as the Cold War rages on. The U.S. and the Soviet Union are locked in a space race, and Apollo 8 becomes the first manned spacecraft to orbit the moon, sending back pictures of Earth from deep space. And Rotary members in North Carolina, USA, charter the first Rotaract club, to provide young people opportunities for service. A half-century has passed since those first Rotaract clubs began inspiring young leaders to take action to improve their communities. The world has changed, as has the way Rotaract members connect with one another. But the underlying values of the program, and what attracts people to it, remain remarkably the same. To celebrate Rotaract’s 50th anniversary, we asked former Rotaractors from six decades to share their experiences of the program and explain how it shaped their lives. Geetha Jayaram, a pre-med student in Bangalore, India, became charter secretary of an early Rotaract club in 1968. Her father was an influential businessman in the city, and he and his friends believed the program was the perfect place for their college-age children. Within a year, Rotaract was already so established in India that a district conference in 1969 drew thousands. Jayaram believes the program took off so fast there because the need for helping others was so evident. Geetha Jayaram, left, pictured at one of the health clinics she founded in India, was a charter secretary of a Rotaract club in 1968. Rotary’s Four-Way Test, with its reference to “the truth,” also appealed to young people. “We were post-independence children and Gandhi followers, and speaking the truth was a big thing in those days,” she says. Jayaram says Rotaract benefited from Rotary’s reputation as a well-respected organization in India. People felt proud to belong to it. Participating in Rotary was a family activity, so many young people grew up experiencing Rotary events. “Every time we’d go to some picnic or concert or competition, there were always adults with children involved with all of the games and activities and food preparing,” Jayaram says. After finishing her bachelor’s degree, Jayaram came to the United States to pursue advanced degrees in medicine. She joined a Rotary club in Maryland in 1997 and founded the Maanasi Clinic in Mugalur, Karnataka, India, to provide mental health services to indigent women there. A former recipient of a Rotary Grant for University Teachers, she was awarded the Rotary Global Alumni Service to Humanity Award in 2014-15. She is an associate professor in the departments of psychiatry, public health, nursing, and the Armstrong Institute for Patient Safety and Quality at the Johns Hopkins School of Medicine in Baltimore. Lunar rovers explore the surface of the moon. Skylab begins orbiting the Earth. The Vietnam War comes to an end. In Sudan and Zaire, the first outbreak of the Ebola virus occurs. On the entertainment front, the movie Star Wars premieres. The first videocassette recorders enter the market, and Sony introduces the Walkman. Disco becomes popular. John Skerritt helped charter the Rotaract Club of Carlingford, New South Wales, Australia, in 1978, after reading a newspaper advertisement placed by local Rotarians wanting to start a Rotaract club. “That was the way you did it before the internet or cable TV,” Skerritt says. The new club drew young people from many backgrounds. In Australia in the 1970s, Skerritt says, a significant number of teenagers left high school early to pursue a job in the trades, and fewer than today went on to college. And for economic reasons, many tended to live with their parents until they married or had established themselves in a career. The Rotaract Club of Ipswich, Queensland, Australia holds a car wash as a club fundraiser in the early 1970s. Rotaract drew young people from many backgrounds. In some ways, he contends, young people had more freedom then. He recalls two club fundraisers, one where Interact members sat on a platform on top of a pole for 100 hours, and another where the Rotaract members drove cars in a demolition derby. “Can you imagine a club doing that now?” he asks. One charity his club supported ended up having a big influence on his career. The organization helped people with hard-to-treat epilepsy who lived in a specialized care community. Skerritt went on to research seizure medications as part of his doctoral studies, and today he is therapeutic goods administrator in Australia’s Department of Health. Ted Turner announces the creation of CNN. IBM begins releasing personal computers. India Prime Minister Indira Gandhi is killed by two of her bodyguards. Mikhail Gorbachev becomes leader of the Soviet Union, and the policies of glasnost and perestroika transform world politics. A nuclear accident occurs at Chernobyl. The Berlin Wall falls in 1989. Arcades are jammed with people playing Pac-Man, while elsewhere folks fiddle with the Rubik’s Cube. In Colombo, Sri Lanka, in the early 1980s, most things shut down by 7 p.m. TV was still relatively new, and people did not own their own computers. As a result, young people turned to Rotaract for their nighttime entertainment. You formed bonds that never go away. It’s been almost 40 years now, and we still pick up where we left off. At the time, since they were in the same district, Rotaract members from Sri Lanka and southern India traveled back and forth between the countries for regional assemblies and training events. This promoted cross-cultural understanding. Rotaract also served as a unifying force during Sri Lanka’s civil war. Rotaractors in England pull the Concord down a runway as a fundraiser and publicity effort. In the early 1980s, Richard Blackman witnessed some of those unifying forces as a member of the Rotaract Club of Dover, England. His favorite memory involves helping a group of Rotaractors from the Netherlands cross the English Channel in their unique amphibious vehicle. The event was a fundraiser for Rotary’s relatively new campaign to eradicate polio, and it involved a large vehicle that seated more than two dozen Rotaractors who provided pedal power for propulsion. Blackman helped make arrangements for the Dutch Rotaractors in London and put them in touch with a Rotarian who could get them access to the Hover port in Dover so they could get their vehicle into the water. German reunification in 1990 ends 45 years of separation. Lech Walęsa becomes the first president of Poland since the end of World War II. The Soviet Union collapses on Christmas Day 1991. Nelson Mandela is released from prison and becomes president of South Africa four years later. The Hubble Space Telescope is launched. Pathfinder sends back images of Mars. The internet grows exponentially. Every kid wants a Furby, and Pokémon and Power Rangers rule. Two monumental world events shaped Cyril Noirtin’s experience with the Rotaract clubs of Nancy and Paris Royale in France: the opening of Eastern Europe after the fall of the Berlin Wall in 1989, and the advent of the internet. The Rotary district in western Europe was in charge of extending Rotary into Ukraine, and Noirtin was asked to establish Rotaract there. Rotaractors in Brazil circle a tree in 1993 for World Rotaract Week. The internet also began to connect the world. “When I joined, to communicate with other countries, you sent letters. If you were lucky, you had a fax,” Noirtin said. “By the end of the decade, most clubs had websites and email, and people were starting to speak of social media. CEO of a private university in France and a Rotary representative to UNESCO, Noirtin says his experience in Rotaract benefited his career. The Y2K bug is less devastating than predicted. Russians and Americans work on the International Space Station. A working draft of the human genome is published. Terrorists attack the World Trade Center and the Pentagon. The U.S. invades Afghanistan. The euro is introduced in 12 countries. Facebook is founded by Harvard student Mark Zuckerberg, YouTube and Twitter launch, and Apple releases the iPhone. Andrea Tirone recalls cozy meetings in the Hart House student center during her early years as a Rotaractor at the University of Toronto. The Rotaract Club of Downtown San Diego, California, USA, prepares for a life skills event in 2008 that provides professional development and leadership training. Selected for an Ambassadorial Scholarship to South Africa in 2009-10, Tirone helped charter the Rotaract Club of Berea while there. But before she left, she attended the 2008 Rotary International Convention in Los Angeles, which changed her perspective of the organization. As it begins its second half-century, Rotaract remains as appealing as ever to young people, says Laura Verdegaal, who, as a member of the Rotaract Club of Gooi- en Vechtstreek in the Netherlands, participated in a panel in December via Facebook on the state of Rotaract. Rotaractors in Ukraine in 2012. Members of the Rotaract and Interact committee wear their 50th anniversary celebration shirts for a committee meeting in 2017. “I think in ways it’s even more relevant, as there is a movement back from globalization to knowing where your food and goods come from and knowing people in your local community who share your values,” she says. Verdegaal sees Rotary and Rotaract clubs enjoying a more equal and fruitful partnership, one in which members of Rotaract collaborate in decision making and planning, rather than serving in a subservient role. She cites a large project in her district where Rotaractors with web skills provided the main direction for the design and content of the project’s website. Rotaractors in England participate in a Bed Push race to raise money for the Birmingham Children's Hospital in 1984. The event organized by the Rotaract Club of Coleshill, England, was held in conjunction with the Rotary International Convention in Birmingham that year. Rotaract gave young people a chance to help others. Rotaractors from the Netherlands use pedal power to cross the English Channel in their amphibious vehicle. Richard Blackman and members of his Rotaract club in one of their meeting spots. 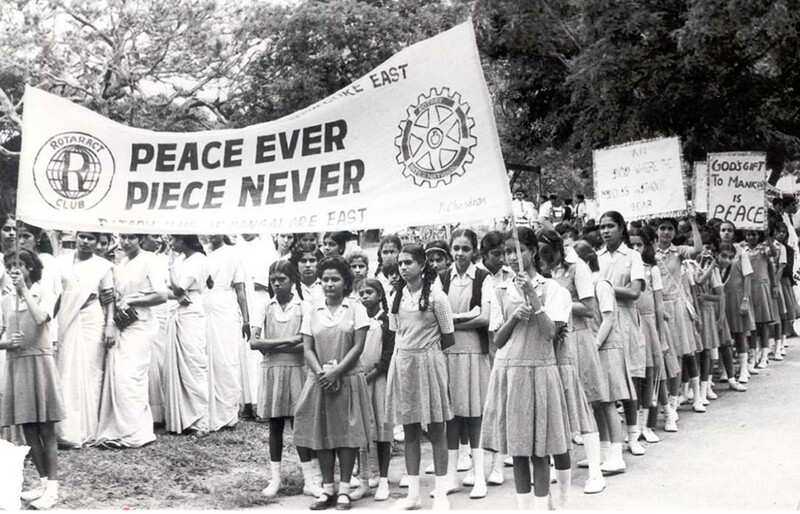 Women and school girls march in a peace parade sponsored by the Rotary and Rotaract clubs of Bangalore East, India, circa 1986.